On May 26, Fox News aired a special, Meet the Trumps, in which the network introduced the members of the would-be First Family. After attempting to differentiate Don Junior from Eric — still confusing — the camera lingered on a familiar face. “And of course, we all know Ivanka,” said Greta Van Susteren. Of course, we all know Ivanka. This is true especially in New York, where Trump’s eldest daughter has become, like her father, one of the city’s stock characters, albeit one whose personality is more in line with the city’s current self-image than his. Where The Donald scowls and stomps and blusters around town like a fat-cat ghost from another era, Ivanka moves gracefully, with the unwavering poise she displayed in the 2003 documentary Born Rich, in which she was one of the few heiresses to comport herself with dignity. It is often noted that she is the polar opposite of Donald, the suggestion being that someone as controlled as Ivanka must be somewhat embarrassed by her circus-clown father. 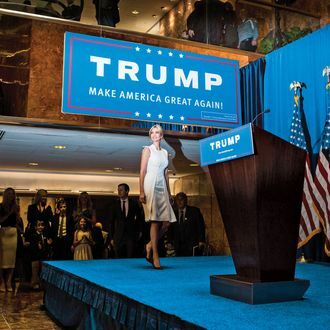 But no: Ivanka is “absolutely proud to be a Trump,” as she told the makers of Born Rich, and shares with her father a sense of outsize ambition. On her this patrilineal zeal looks so much better, more modern: less “Greed is good” and more “You go, girl.” And over the years, as Ivanka built her own brand — as a model, an executive at the Trump Organization, a sometime Apprentice guest, the owner of an eponymous clothing label — she has earned many admirers, including such discerning customers as Anna Wintour and Michael Bloomberg. So it’s been somewhat startling to see this Ivanka — the Ivanka we know — seemingly wholeheartedly embrace a campaign that features xenophobia, racism, and general lack of civility as its central themes. Even though she told us in The Trump Card: Playing to Win in Work and Life that she was a “daddy’s girl,” it’s still hard to comprehend the level of filial loyalty that compelled Ivanka to defend her father’s grotesque comments about Megyn Kelly’s “blood coming out of her wherever” and straight-facedly call him a “feminist.” It’s hard to believe that the Ivanka whose New York social circle consists of people from all over the world truly supports the idea of Building a Wall. Given the intelligence we know she possesses, it’s tempting to see tightness in her smile as she stands behind her father, blustering at the podium, and read sarcasm in her cheery tweets (“There’s power in looking silly and not caring that you do,” she wrote — quoting Amy Poehler — after her father’s Brexit gaffe). Perhaps this is the reason we’ve allowed a sub-narrative to take root, one that casts Ivanka as the Trump campaign’s Secret Voice of Reason. He’s her father — she has to support his cockamamie run to some degree, the thinking goes, but she’s not like him. If you look hard enough, there’s just enough to suggest that this might be so: After Trump referred to Mexican immigrants as criminals and rapists, reports quickly followed that Ivanka was horrified by his comments. After Orlando, anonymous sources noted that Trump’s line about standing with the LGBT community was “Ivanka-ish.” And after Trump’s thuggish campaign manager Corey Lewandowski was fired, sources claimed that it was Ivanka who’d vanquished him. It’s almost as though the birds and house mice who helped Cinderella now follow Ivanka around, prettying up her part of the narrative. *This article appears in the July 11, 2016 issue of New York Magazine.